Ireland’s most magical address, Dromoland Castle Hotel, has been welcoming guests since the 16th century. It is the ancestral home of the O’Briens of Dromoland, with a lineage that dates back over 1,000 years to one of the last High Kings of Ireland, Brian Boru. The castle was massively updated and renovated in the 1820s, with additions, carvings, and priceless art, and little having changed since then. After traversing a long, curving drive past a large-walled garden and the large lake, visitors can behold the monumental castle, with its four linked castellated turrets and gothic porch. Discover a world of historic grandeur with luxury accommodations at Dromoland Castle Hotel. It features amenities such as bespoke designs, luxury toiletries, breathtaking views, lush bedding on four poster beds, and complimentary WiFi. Indulge in an authentic Irish meal at the Earl of Thomond, The Gallery, or the golf course clubhouse restaurant, the Figtree Restaurant. Play on the par 72 golf course, or relax and destress at The Spa at Dromoland Castle. Enjoy family time with a number of activities offered, including biking, hiking, archery, falconry, and fishing. Those looking to begin a new life together will find that Dromoland is the ideal Irish castle for an unforgettable love story with over 7,000 square feet of event space. Guests are also welcome to hold meetings, galas, conferences, and product launches at this lovely castle, with its impressive high ceilings, gothic architecture, and impeccable service staff. Dromoland Castle Hotel is the gateway to Ireland's history and culture, perfectly located to explore the South and South-West of Ireland, and the Wild Atlantic Way, 2,500 km of unforgettable coastal roads. Also located in County Clare is the Burren and Cliffs of Moher UNESCO Global Geopark, an ancient lunar-like limestone landscape. Locally, visitors can experience Ireland’s rich history, from the medieval town of Ennis to a medieval feast at Bunratty Castle, and a stroll past the Georgian buildings of Limerick City. Dive into Ireland’s ancient heritage with a day trip to the magical Aran Islands and music-filled streets of Galway City, or make for the coast and breathe in the purest air rushing over the Atlantic spray. 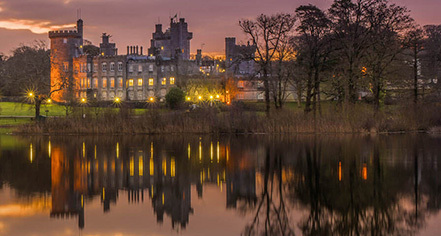 Dromoland Castle Hotel, a member of Historic Hotels Worldwide since 2011, dates back to 1014. Dromoland Castle was the birthplace and boyhood home of William Smith O’Brien, M.P., who fought for the rights of oppressed Irish Catholic peasant farmers and led the Young Irelanders rebellion against the British authorities in 1848. 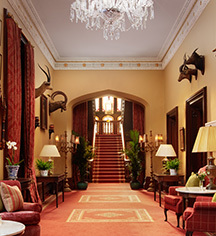 Ireland’s most magical address, Dromoland Castle Hotel, has been welcoming guests since the 16th century. It is the ancestral home of the O’Briens of Dromoland, with a lineage that dates back over 1,000 years to one of the last High Kings of Ireland, Brian Boru. Learn more about the History of Dromoland Castle Hotel .